« Does Trump Deserve Credit for Surging Stock Prices? But just in case you don’t have a spare hour to watch the full video, I can tell you that it explains how New Zealand made a radical shift to free markets in key areas such as agriculture, trade, fisheries, and industry. I wrote about New Zealand’s shift to a property rights-based fisheries system, which is a remarkable success. But I’m even more impressed that the country, which has a very significant agricultural sector, decided to eliminate all subsidies. I fantasize about similar reforms in the United States. To give you an idea of New Zealand’s overall deregulatory success, it is now ranked first in the World Bank’s Doing Business. As a fiscal policy wonk, my one complaint is that the video doesn’t give much attention to tax and budget policy. Which is an unfortunate oversight because there’s a very positive story to tell. In the early 1990s, the government basically imposed a nominal spending freeze. 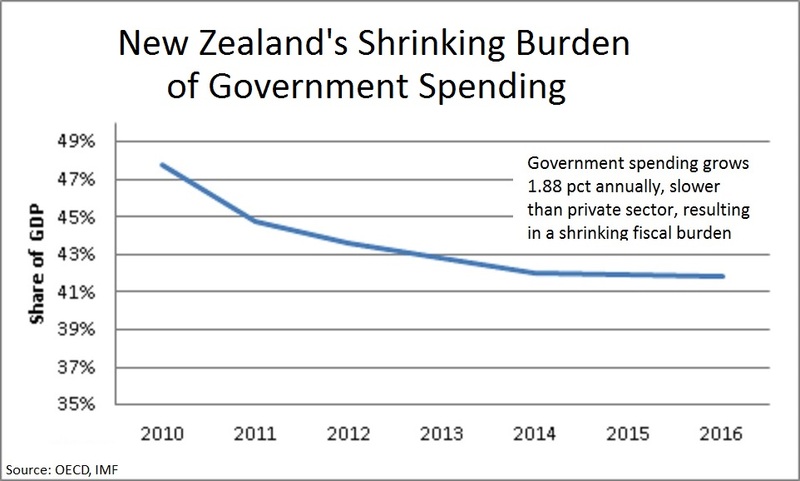 And during that five-year period, the burden of government spending fell by more than 10-percentage points of GDP. And because policy makers dealt with the underlying disease of too much spending, that also meant eliminating the symptom of red ink. In other words, a big deficit became a big surplus. The same thing also has been happening this decade. Outlays have been increasing by an average of less than 2 percent annually. And because this complies with my Golden Rule, that means a shrinking burden of spending. And there’s also a good story to tell about tax policy. The top income tax rate has been slashed from 66 percent to 33 percent, and the capital gains tax has been abolished. Let’s close by highlighting what should be the main lesson of the video, namely that any country can rescue itself from economic decline. As I watched, the first thing that occurred to me is that New Zealand’s reforms are – or at least should be – a road map for Greece to follow. The Fraser Institute’s Economic Freedom of the World shows the history of economic liberty in the two nations, and you can see that they used to be very similar – in a bad way – back in the 1970s. They began to diverge between 1975 and 1985, mostly because policy got even worse in Greece. Then both adopted better policy started in 1985, but New Zealand went much farther in the right direction. Policy has been generally stable in both nations this century. That’s acceptable for New Zealand, but it’s basically a recipe for continued misery in Greece. But the good news is that Greece can simply copy New Zealand to get the same good results. P.S. Remember when Gary Johnson caught grief for being unable to list any admirable foreign leaders. I defended him by pointing out that there are not any obvious choices in office today, but I did mention that Roger Douglas and Ruth Richardson – both prominently featured in the above video – would be on list if it included former politicians. P.P.S. New Zealand ranks #3 for total human freedom, trailing only Hong Kong and Switzerland. on August 13, 2018 at 10:28 am Which Countries have the Best Record in Protecting Property Rights? Ms Ardern has cited New Zealand’s poverty and homelessness among her top priorities, yesterday calling capitalism a “blatant failure” in her country. Today, she doubled down. “There is no point gloating about the economic growth of a nation if you have some of the highest rates of homelessness in the developed world,” local media quoted Ms Ardern as saying. I guess this does not bode well? so why Michael Reddell are you still with us?? regards, Trevor. How is the QMS different than say Taxi Medallions? Do they work because the ocean is a Commons? Unfortunately, despite all the good stuff that was done here – some highlighted in this post – NZ’s productivity performance has continued to lag behind that of other advanced countries. 100 years ago we were in the top handful of countries. Now, if one is lucky, perhaps 25th. Even in per capita GDP terms, the gap has barely changed since the reforms, with increased hours worked per capita offsetting a slow trend downwards in relative GDP per hour worked. I emigrated to New Zealand in 2003; it’s a wonderful place. Excellent video, well worth watching.